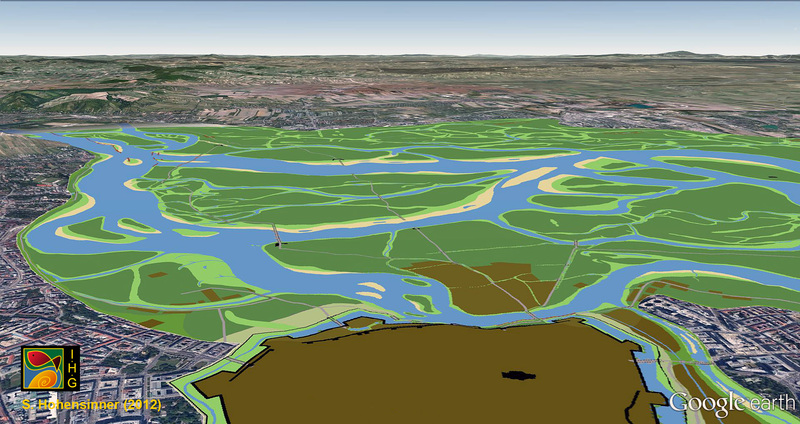 Transformation of the Viennese Danube river landscape between 1529 and 2010. Medieval Vienna was situated at the main arm of the alpine Danube River, which branched out across a huge floodplain to the northeast of the city. While the river was vital to the city, floods regularly destroyed infrastructure and led to costly repairs. From the fourteenth century onwards, the Danube gradually moved away from the city. This marked the beginning of 500 years of human intervention to prevent further removal of the river and to preserve the waterway as a vital supply line. Massive river engineering measures were undertaken in order to secure Vienna’s demands from the sixteenth century onwards. In 1565/1566, the Danube once more moved its main branch further away from the city. In the following decades, repeated attempts to force the main arm into the old river bed were undertaken. By the early seventeenth century, the Viennese authorities had accepted the new situation. Resources were now spent on maintaining the waterway to the city via the remaining Wiener arm, the ancestor of the current Donaukanal. After the second Ottoman siege in 1683, improving the navigability of the Wiener arm, in conjunction with major expansions of the fortifications of Vienna, became the main issue. Until 1726 elaborate hydraulic structures were erected (in the foreground) to secure the flow and the navigability in the side arm towards the city centre. Various river authorities had been set up over the centuries. They began to ponder a large-scale solution to the threats posed by the Danube. Between 1775 and 1792, the first systematic, effective flood protection measures were established. These substantially influenced fluvial dynamics and enabled urban development in parts of the former floodplain. The all-embracing transformation of the dynamic riverscape into stabilized areas enabling urban growth and secure waterways was not achieved until 1875. 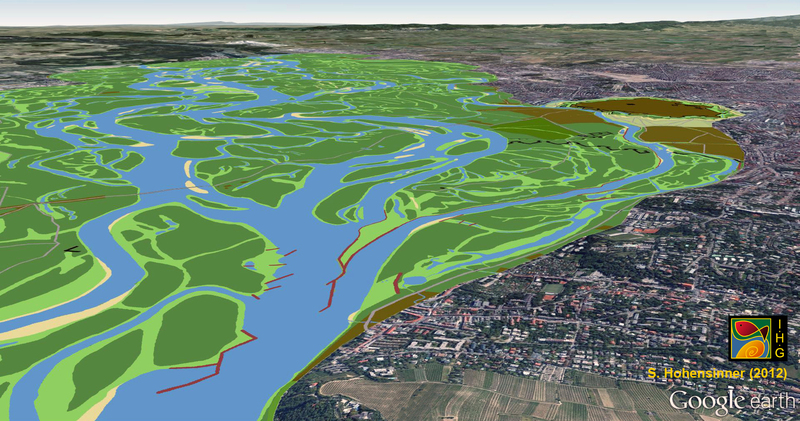 A GIS data base comprising 1800 historical river engineering measures (1200 – 1900 CE) was established for the reconstruction of the Viennese riverscape. 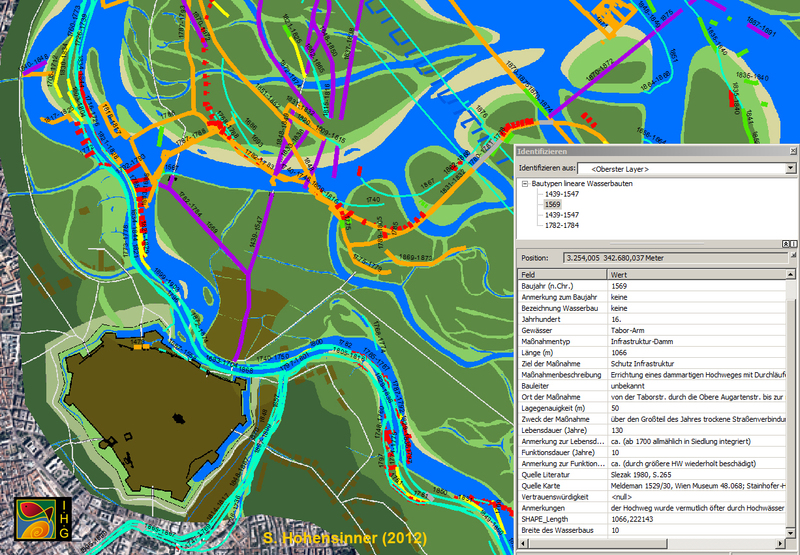 The methodological approach developed for the investigation of the Danube history in Vienna proves that combined archival research and GIS reconstruction of historical river landscapes and river engineering measures provide a useful tool for integrative research in environmental history. Hohensinner, Severin. “The Struggle with the River: Vienna and the Danube from 1500 to the Present.” Environment & Society Portal, Arcadia (2012), no. 19. Rachel Carson Center for Environment and Society. https://doi.org/10.5282/rcc/4959. Hohensinner, Severin, Bernhard Lager, Christoph Sonnlechner, Gertrud Haidvogl, Sylvia Gierlinger, Martin Schmid, Fridolin Krausmann, and Verena Winiwarter, “Changes in water and land: the reconstructed Viennese riverscape 1500 to the present,” in Water History, IWHA, Springer, forthcoming 2013. Hohensinner, Severin, Christoph Sonnlechner, Martin Schmid, and Verena Winiwarter. “Two steps back, one step forward: Reconstructing the dynamic Danube riverscape under human influence in Vienna,” in Water History, IWHA, Springer, forthcoming 2013.